Synaxis Webface: This amazing software enables the same applications we develop for Windows also to be run from a web browser. This includes all the Adroit client applications except EnvisionIT. Hence users with ANY operating system that supports a web browser (e.g. Windows, MAC OS X, Linux) can run Adroit clients without installing any software. Our Synaxis Online data-processing services all use the Adroit Server software. The Adroit® suite is a software system developed by Synaxis Data Services as a toolset capable of helping organisations solve problems with (and exploit the value of) data held in computer systems. Currently it covers areas such as data-integration (e.g. generation of single-customer view from disparate systems), data reconnaissance and direct-marketing campaign management. 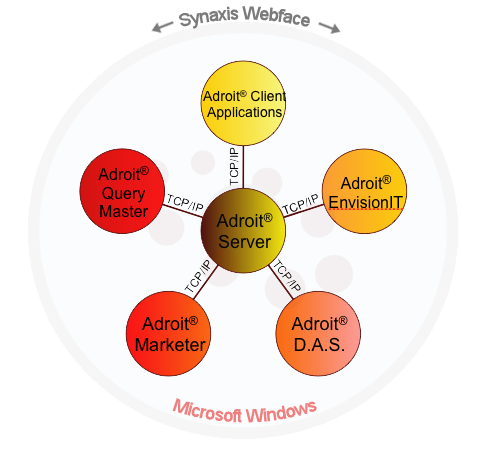 At its core is the Adroit® Server - a high-performance data-processing engine uniquely able to take the data it processes from almost any source or combination of sources. Follow the links above for a brief description.